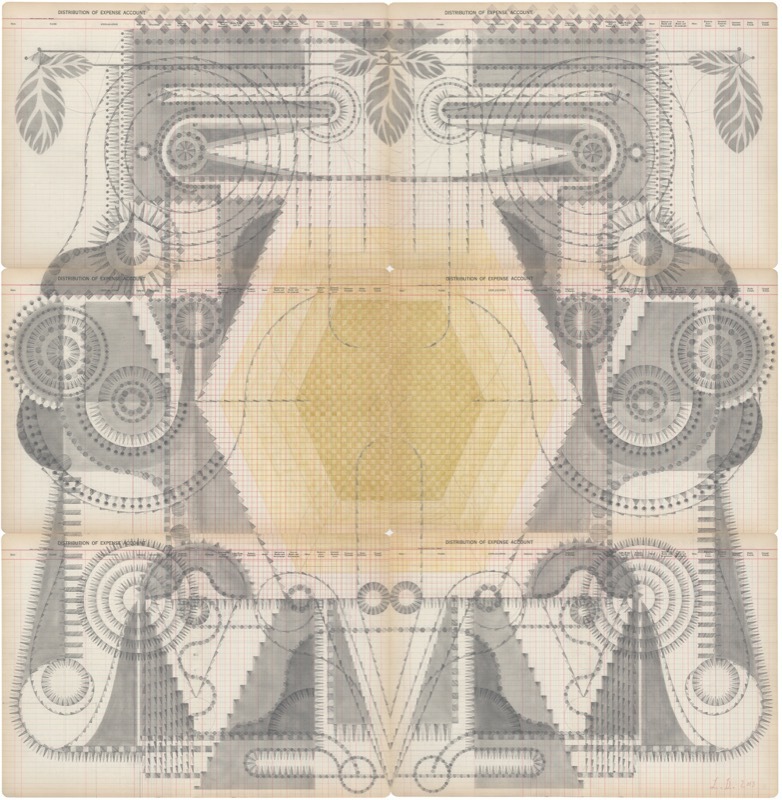 Louise Despont explores drawing as abstract meditations, employing and recasting a vocabulary of elements found within a set of architectural stencils and compasses, onto the pages of antique ledger books. For this exhibition, Despont has borrowed the geometries of beehives, gardens, and found architecture to offer balanced forms that engage past and present as indicators and provocations. In view of colony collapse, and other environmental concerns, The Six Sided Force investigates the subtle architectures, seen and unseen, between nature and human influence. Louise Despont received her BA in Art Semiotics at Brown University in 2006. Her work has been presented internationally in public and private venues including Nicelle Beauchene Gallery, New York; VI,VII, Oslo; Petit Palais, Paris; The Museum of Arts and Design; New York; Marianne Boesky Gallery, New York; The High Museum of Art, Atlanta; IMO Projects, Copenhagen; Galerie Isa, Mumbai; Foxy Production, New York; and Ibid Projects, London, among numerous others. Despont’s work is featured in Vitamin D2: New Perspectives in Drawing (Phaidon Press) and Louise Despont (Nicelle Beauchene Gallery / Ibid Projects). The artist is the recipient of a Fulbright Fellowship, a Weston Price Film Award from Brown University, Princess Grace Grant recipient, and Macdowell fellow. She lives and works in New York.